In early May, I reluctantly accepted my parental obligation to bring my children to Orlando, Florida. The Disney mystique hasn’t entranced my brood the way it seems to insidiously seize so many others, but various factors conspired to drive us to notorious attractions like Disney’s Magic Kingdom, Sea World, and Legoland. At least, thought I, Florida would produce some superior birds. So I packed my binoculars thinking that, even if the trip wouldn’t be as bird-rich as my last trip to the Sunshine State (for the mighty, mighty Space Coast Birding & Wildlife Festival), at least a few crackers would wing my way. In this, I was absolutely wrong. I must have picked the wrong attraction. 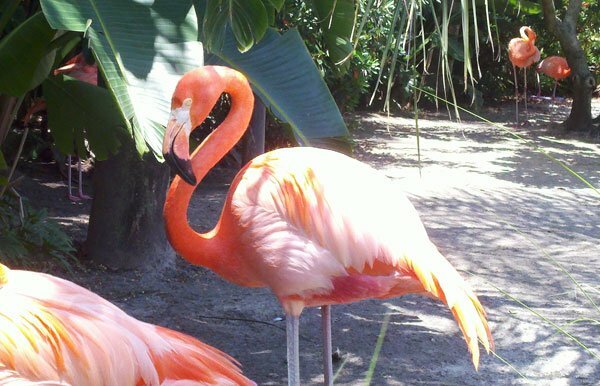 If you’re looking for birds, try Disney’s Animal Kingdom. The Magic Kingdom featured Donald, Daisy, and a few Mallards… we all know how much Disney likes ducks! Actually, the best live bird I spotted on site was a wild White Ibis, one of my favorite Florida birds. Also of note were the extremely imaginative avifauna embellishing the “It’s a Small World” ride… psychedelic! One would expect a marine-themed attraction to deliver some sweet bird species. I obviously didn’t anticipate a pelagic vibe, but even fish hatcheries can offer excellent birding. Not Sea World. All the best birds were part of the show, from the exotic ducks and flamingos in pens to the Blue and Gold and Blue-throated Macaws performing in the Blue Horizons show. If I recall correctly, there was also a soaring Andean Condor. But the best wild birds of Sea World might have been Boat-tailed Grackles, which says quite a bit about the sterility of the environment. 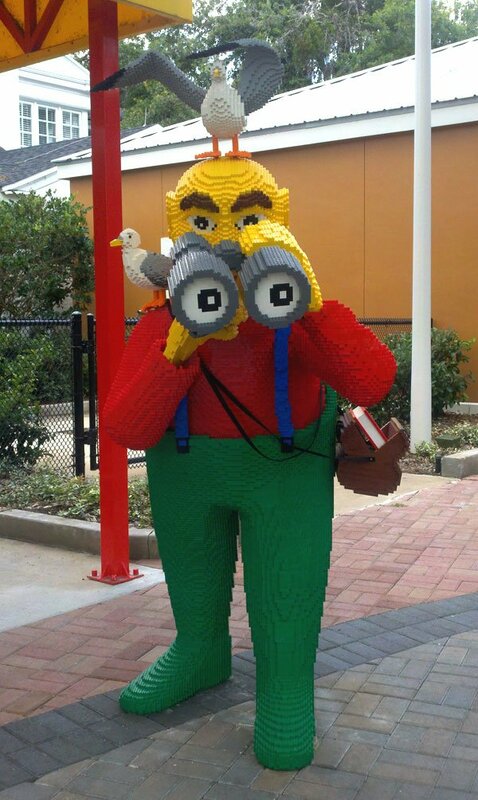 This Lego bird watcher flaunts classy optics, a field guide in a field bag, and the kind of gaudy green waders more of us should wear for wetland excursions. Are you feeling the Lego love? All in all, I enjoyed my Orlando adventure immensely in spite of the awful birding. Florida is fabulous for wildlife watching, but some places are simply too sterile for the wild to take hold. Do you have birding stories from Orlando, Florida? Share them in the comments section! Mike, it looks as if they have managed to distill your very essence into a small plastic brick. Is there nothing you can’t do with Lego? I assume, Redgannet, that you’re referring to my poor gull-spotting skills and not those kelly green waders, which I’d be proud to wear! My Magic Kingdom list consisted of 5 birds. Looks like a birding Homer Simpson!